Dr. Michael Ben-Ari calls on Attorney General to open investigation into opposition head's negotiation with Abbas. Former MK Dr. Michael Ben-Ari, the head of the Otzma Yehudit party, has called on Attorney General Avichai Mandelblit to open an investigation into opposition head Yitzhak Herzog (Zionist Union) and his associates. 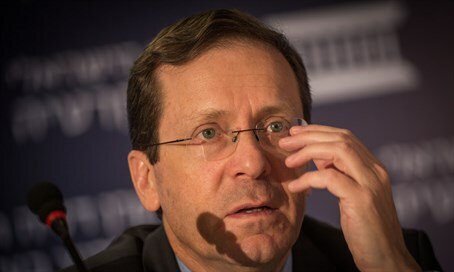 The demand is based on recent reports of secret negotiations Herzog conducted with Palestinian Authority President Mahmoud Abbas. In his letter, Dr. Ben-Ari wrote, "In the past day it was announced that several people, under the leadership of MK Yitzhak Herzog, Mr. Ephraim Sneh and others, carried out negotiations with Abu Mazen (another name for Abbas). As part of the talks, Mr. Herzog and his companions plotted to give the enemy sections of our homeland, including areas in Jerusalem under Israeli sovereignty. "With this act, Herzog and his associated negotiated with a foreign entity about handing over parts of our homeland and creating a separate country on parts of the State of Israel, all of which is illegal. Criminal law declares that anyone who performs such an act, with the intention of taking land away from Israeli sovereignty or giving land to a foreign country, is liable to the death penalty or life in prison." Ben-Ari emphasized that "we should not underestimate or dismiss the plot by ascribing it to 'good faith' or a 'political action.' The actions were carried out secretly, without authority and without a political platform to legitimately present it to the public. Ignoring this treacherous crime will make the aforementioned law meaningless and will encourage similar acts of treason." Earlier on Tuesday, Dr. Ben-Ari said: "We have seen how efficient the Attorney General and investigating bodies are when they are questioning right-wing activists who suggested creating a 'Kingdom of Israel.' We expect that now, when there is a much more serious issue and real action to support our enemy, the Attorney General will act at least as seriously. "The legislature was designed precisely for incidents such as this and we must apply the law in order to stop the harm to the country," he added.